Recently we noticed that there has been an increase in traffic looking for Gregory of Colorado, the American Bishop of ROAC who was effectively deposed in 2004 for attempting to subvert the Synod. This made us here at NFTU curious as to what was going on Gregory’s “Synod” in recent days. What we found was a shock. 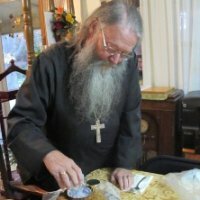 What is not news is that in November of last year, Gregory of Colorado single-handedly consecrated Ambrose (Moran), an apparent Bishop of the UAOC (attempts on our part to determine what jurisdiction he had come from were fruitless), claiming he had the blessing of Abp Makarios of Athens (GOC-Makarios) to do so. In that same month, a letter appeared on the “Omologitis” web site denying that the Synod had never blessed such an action, as Gregory of Colorado was never a Bishop of their Synod to begin with. Immediately Gregory issued a response stating that he “did not ask for a synodal decision, deeming it unnecessary, because no one was asking to be received into the Synod of the GOC of Greece”, and that he only asked Archbishop Makarios (!) Also not news today is that in January, Archbishop Makarios denied the whole affair. What is news, and what seems to have quietly been added to their “Genuine Orthodox Church of America” website, is astounding. 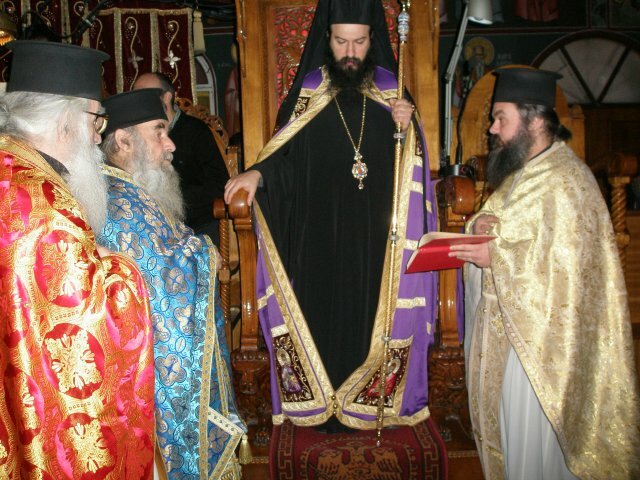 On July 8, New Style, Gregory finally justifies his claim against Archbishop Makarios by putting up what are apparent transcripts of conference calls between himself, Fr Athanasios Tsorvas the loyal translator, and Archbishop Makarios. The transcripts are incredibly revealing and demonstrate to what lengths Gregory of Colorado was willing to go to for the purpose of getting a second Bishop and accomplishing his long range goal of consecrating his spiritual son, Fr George (Mills), to the episcopate. We’ve already saved copies of the transcript and we suggest to everyone who can to do the same. NFTU will retain copies of the original in case it “changes”. – Apparently that was not fast enough, and Gregory and his translator searched Makarios out to get an answer within six days. The reason the question of two Bishops was so important was because the Apostolic rules were about consecrating new Bishops. Two Bishops could consecrate a new Bishop in times of emergency. But a single Bishop could receive in a Bishop properly consecrated who had fallen to heresy. Gregory never believed Ambrose’s consecration was real; thus, he needed to be reconsecrated as a Bishop. But Abp Makarios had no intention of doing such a thing, and at this point probably regrets picking up the telephone. Gregory of Colorado has combined two situations to make it look like they are one: he has used the argument for receiving in a single Bishop to justify a single-handed consecration. And the truth is that if Gregory of Colorado, removed from ROAC for ecclesiastical offenses, single-handedly consecrated a Bishop with no justification whatsoever (for all of Gregory’s screams against the Matthewites for a single handed consecration, Bp Matthew was persecuted in Greece, while Gregory’s biggest problem is air pressure in the Colorado mountains), and these two Bishops made another one, then the GOCA is truly from their own admission what people worldwide have been claiming– a “personal church”, and not a single Bishop there has a right to ordain a priest, let alone each other. The transcript is below, click “Read Full Story” to see it. AbM: [Answers telephone] If you please. AbG: Yes, Evlogeite Your Beatitude! AbM: O Kyrios! What’s happening? AbG: Did he get our fax, Father? Ask him. FrA: Despota is asking if you received the fax. AbM: Yes, indeed, I received it. I received it. I will study it these days. I will study it during these days and respond. Did you hear me? FrA: Yes, indeed. I will tell Despota for a moment. FrA: He will study it in the next few days and he will reply on it. AbM: Yesterday Father Iakovos sent it to me because I wasn’t here. AbM; I will study it in the next few days and give you an answer. AbM: Next time we communicate, we’ll see. FrA: Will the response be via fax? AbM: See here, I shall be absent because of the Feast of Saint Iakovos. Father Iakovos went up to Thessalonike, and I will be gone in a few days. AbM: Therefore, I do not know if shall respond by fax. It may be telephonically, or by some letter. FrA: Yes. Would you permit me to relate this? FrA: He says he just received the fax yesterday, because he is not at the place where the fax is all the time. Father Iakovos delivered it to him yesterday, but they are going away for two days because Father Iakovos has a feast day coming up, a name day, so they are going into town, and in the next few days he will study it and respond when he has some time to study. AbG: Just tell him, we don’t want to make anything too complicated. Ahh, we’re just asking for permission to receive this man’s repentance. FrA: Despota is saying that I don’t want to create problems and difficulties. If it is possible for you to give the approval to receive him. AbM: Certainly! What I should like to know is when this hierarch cut away (or departed) from Ecumenism. FrA: One moment, let me ask him. FrA: Makariotate wants to know when this bishop finally severed ties with Ecumenism? AbG: Ohh, probably about a couple of years ago. He has been by himself, contemplating where to go and looking for the Church. FrA: Okay. Approximately two years he severed completely from Ecumenism and was studying what direction to take. AbM: Yes. Ehhh, has any punishment ensued from the Ecumenists? Has any penance been imposed? FrA: He asks if any penance was imposed upon him by anybody from Ecumenism? FrA: No! He was by himself. AbM: You mean the other bishops were indifferent to his departure? FrA: No, there were no other bishops. AbM: He was by himself? FrA: Ah, he had left them for many years. The last two years he was entirely alone – independent. AbM: With the contact that he had with Paul Strategeas (of Astoria), is there any document? AbM: I understand from his letter that he had some contact with Paul Strategeas. AbM: Yes, I want to know if there has been any correspondence between them. Perhaps in the event that they rejected him, and it is not true what he said, that he did not approve of them, we find out later otherwise and become a laughingstock. We need to be sure what kind of communication he had with them. If there was anything written, any documentation. FrA: I will ask him. FrA: The main concern that Makariotate has is, when he was in communication with the Astoria, Pavlos, Christodoulos, Kiousites, etc.–is there any official communication, any letters exchanged with them, because it may cause problems in the future when the Kiousites turn around and ridicule us that this man (Ambrose) was rejected by them. AbG: I don’t think there were any letters, but I could find out. I think that they heard about him, and they went to visit him because he is not far away and invited him to come. FrA: Yes. Let me say this. There is no letter, there is no written communication, but they learnt that he was by himself and approached him, and I learned this too from other clergy. AbM: Ah, yes. Does he have any priests with him? FrA: Let me ask him. Does he have any priests with him? AbG: They were all old, and one bishop, and they were all so old, that they all retired from the priesthood. AbG: Now Father, let him speak, and then you talk, so there is no duplication. FrA: Okay. He doesn’t have any functional priests with him right now. AbG: He doesn’t have any functional priests, because they are all old that left, and they all retired. FrA: Okay. Let me see. AbG: And one bishop, too, in Texas. FrA: And he is also retired now, too? Not functioning? AbG: Yea, there is no one. He is by himself. FrA: But he is alive? AbG: He is alive, but on his deathbed. AbM: Yes. Does he have a temple? FrA: Let us finish what he was telling me. FrA: That they were not serving on account of great age. FrA: Does he have any temple? FrA: No, he does not have a church. AbM: Not even one? Where does he liturgize, how does he serve? FrA: Where does he liturgize? Where will he hold services for himself? AbG: Umm, he has, he has a place in Long Island. He has a little chapel there and that’s about it, you know. You know, he may come here, but he has,…there are people there, but not many people followed him. FrA: Okay. He has a little chapel on Long Island, but very few people follow him, but it may happen that he will come to the monastery with Despota. AbG: Tell him, he is fifty years old. AbM: Tell me, is his appearance traditional? Does he have a beard and long hair? FrA: I think so. Is his appearance traditional? Does he have beard, hair and all? AbG: Yes, I sent him a picture. Did he see it? FrA. Uhum. You had a picture sent to him? AbG: Tell him, yes, I sent him a picture. FrA: Yes, he sent a picture to you. AbM: Yes, yes, but the picture was not very clear. The fax makes it like a negative. My initial estimation is that the bishop is able to receive him, but first have him make a libello [legal document, petition]–an exact libello–that he will sign. If his priesthood is unhindered and from canonical bishops, I perceive that it should be okay to go ahead with his intention and receive him, and he can receive him somehow with a forgiveness prayer. I need to study the documents that you sent me and I will respond in a timely manner. Is that okay? FrA: Okay. May it be blessed! AbM: Beautiful. I have to leave from this place, but send my love to Archbishop Gregory. FrA: He has to leave Despota, but I will tell you the final word. Archbishop Makarios now closes his phone, and Father Athanasios begins to translate the conversation. He wants to study what you sent him, but from first observation, he says he doesn’t see a problem to receive him by a forgiveness prayer by yourself, however he wants you to have him write a libello renouncing Ecumenism and everything that goes with it. And he wants to have this letter. He says it would be good if you have him write a letter renouncing Ecumenism officially. AbG: Oh fine, no problem. FrA: Okay, then he says, he doesn’t see no problem at all to go ahead, as long as you find everything in proper order, he says, if you confessed him and you find that everything is in proper order, he says he doesn’t see no problem to go ahead and accept him and receive him. However, at the end, he went ahead and said again, give me some time to study the documents you sent me. But at one point he almost made it certain to go ahead with it. FrA: But again, I need some time to study the documents that you have sent, he said. AbG: Oh, okay, let’s see. Saint Iakovos, when is that? Next Monday. So he is probably going to Thessalonike. Ah, the monastery in Thessalonike is named in honor of Saint Iakovos. Brief conversation with Metropolitan Efthymios of Thessalonike, just prior to second conversation with Archbishop Makarios. Archbishop Ambrose’ libello, was faxed to Metropolitan Efthymios’ residence in Thessalonica, because that was the only fax machine available to Archbishop Makarios when he was in Thessalonike. AbG to FrA: Saint Iakovos is Wednesday, not Monday of next week. So he is probably going to Thessalonike. No, no, it’s the monastery in Thessalonike–it’s named Saint Iakovos. AbG: There it goes. Are you there? AbG: What’s tomorrow? Saint Hilarion the Great? It is. FrA: (After many rings.) He might be at Vespers. AbE: O Kyrios! O Kyrios! AbG: Congratulations on the feast! FrA: Congratulations and many years for the feast, despota. AbE: Thank you, thank you. AbG: I am sorry for calling late. Tell him that you had to take the grandchild to the doctor. FrA: Forgive me for calling late, but I needed to take the granddaughter to the doctor. AbE: Yes. Makariotate [Makarios] is not here. He is at the monastery. FrA: Ah, yes! I will tell him [AbG]. AbG: Did they discuss it? FrA: Did you discuss the matter, despota? AbE: Yes, you should call Makariotate. But not now. It is rather late, 25 minutes to 11 o’clock. So call him tomorrow at the monastery to come to an understanding, because that is where he is. 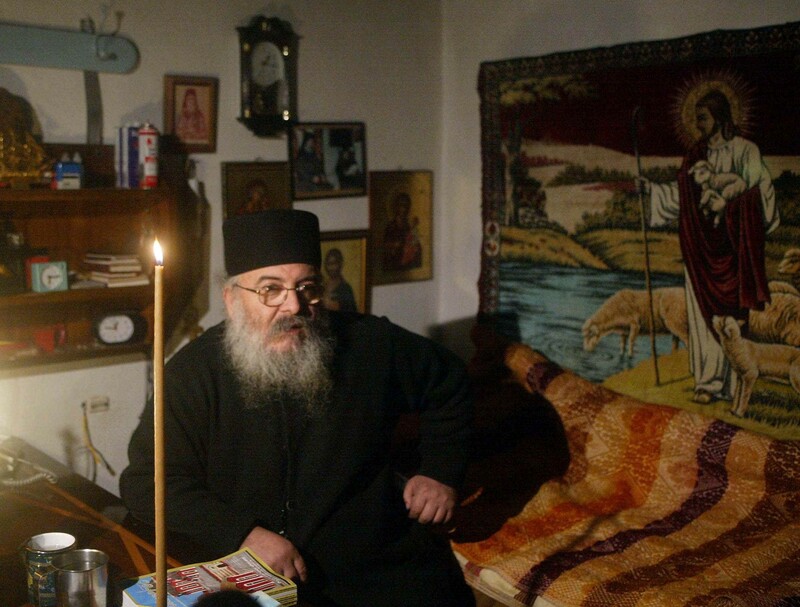 FrA: He says to call the monastery because Makariotate is not there. But even if we call at the monastery now, it is very late. So we should call tomorrow, he said, so you can discuss it, he said. FrA: Ah, what time tomorrow about? AbE: When it is 7:00 in Greece. AbE: No, in the afternoon. FrA: Tomorrow evening, to be about their time about 7:00. AbE: Okay, evlogeite, thank you. Transcription of the second conversation with Archbishop Makarios: dated October 23/November 5, 2007 3:30 pm CST. AbG: Evlogeite, Makariotate. [Your blessing, your Beatitude]. AbM: O Kyrios. How are you? May you be well always! AbG: Many years for the feast! FrA: Many years for the feast! AbM: May you be well Father Athanasios. May you all be well. AbM: O Kyrios, O Kyrios, O Kyrios. AbG: Okay, tell us the good word. FrA: Despota should like to learn…he will ask you if you discussed the matter (subject). AbM: But okay, we did not discuss it especially. We can discuss it among ourselves. It is not necessary to discuss it with the others. AbM: We will talk about these things in Athens when I go down. Yes, yes, yes. FrA: What is your opinion? Shall we proceed? AbM: I said to Despota to have him make a libello for the first phase. FrA: He did. He did it. He did sign. AbM: Proceed! What else is there to do? FrA: Okay. May it be blessed! May it be blessed! AbM: If he is certain from every point of view that he has a canonical ordination and the rest, then proceed certainly. FrA: Everything has been taken care of. He has signed everything. AbM: As long as the Elder (Gregory) is certain from every point of view. FrA: May it be blessed! May it be blessed! AbM: The Elder (Gregory) knows these matters better, indeed. FrA: Okay, okay. I’m sorry that we called you so late. AbM: No, if you please. AbM: May you be well! AbM: May you be well. FrA: Okay. Finished! Proceed (he said)!